PART II: Is 1848 Repeating Itself in the Arab World? Is history repeating itself? Have the events of 1848 in Europe repeated themselves in the Arab World? Will 2011 see the same outcomes as 1848? Only the Arab people can decide. Their fate is in their hands, but they should learn from the mistakes of 1848 and seriously address the role of the capitalist class. During the formal period of colonialism, the authority of the colonial powers (Britain, France, and Italy) were politically visible. Today, the Arab World is under the “invisible authority” of the neo-colonial powers. These include the U.S., Britain, and France. The modern-day neo-colonial powers maintain control over Arab countries through the supervision of their economies and the control of their political leaders, who serve neo-colonial interests as vassals. Thus, 2011 is not only the start of the second wave of Arab revolt against foreign rule via imposed dictators and corrupt regimes, but it is also part of a broader struggle against neo-colonialism. Starting with Tunisia, revolts and protests have broken out across the Arab World. Algeria, Yemen, Jordan, the Israeli-occupied Palestinian Territories, Mauritania, Sudan, and Egypt have all been electrified with activism. 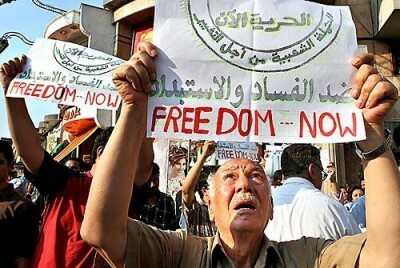 Added to this is the political tension in Lebanon, continued instability in Iraq under American-led foreign military occupation, building tensions in Bahrain, and the balkanization of Sudan. At first glance the Arab World seems to be in turmoil, but there is much more than meets the eye. The people of the Arab World have not awoken, they were already awake. They have watched the resources and wealth of their countries being handed out to foreign corporations and squandered by their corrupt leaders. 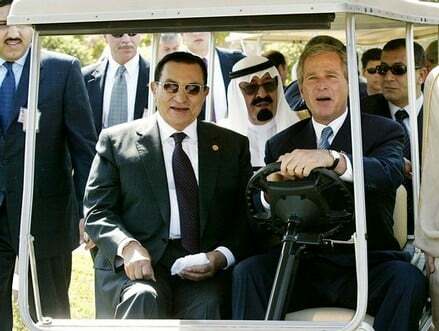 The Arab people have watched as these same leaders supported the invasion and occupation of Iraq in 2003. They have watched as Israel has oppressed the Palestinians with the help of their governments, they have watched as Lebanon was attacked in 2006 with the tacit blessing of their regimes, they have watched as the Gaza Strip was re-invaded in 2008 by the Israeli military, and they have watched as the Egyptian regime has helped Israel starve Gaza. The Arabs have not awoken, they have watched in anger and frustration. The Arab people are now mobilizing. The Arab masses, like the immune system of a body, are now combating the diseases that have been infecting the Arab World. The Arabs are in action. Class polarization has grown as the gap between the rich and the poor widens. Intergenerational mobility, a change in social class that takes place in one person’s lifetime, and intragenerational mobility, a change that takes place from one generation to the next generation within a family, have been stunted. The Arab people grasp the fact that their ruling class and governments are not only corrupt regimes, but also comprador elites, namely the local representatives of foreign corporations, governments, and interests. The capitalist class that these local Arab comprador elites are subservient to are properly called parasite or parasitic elites, because they siphon off local wealth and resources on behalf of their neo-colonial masters. This structure of comprador elites prevails in Egypt, Tunisia, Lebanon, and the Palestinian Authority. In Egypt, Gamal Mubarak (who was being groomed by his father, Mohammed Husni Mubarak, for the presidency) worked for Bank of America. In Tunisia, Zine Al-Abidine Ben Ali was a military officer trained in French and American military schools who, once in power, served U.S. and French economic interests. In Lebanon, Fouad Siniora was a former Citibank official before he became prime minister and Rafik Al-Hariri worked for both the French construction company Ogre (before he established Saudi Orgre) and Saudi interests (which in turn serve U.S. interests) before he became Lebanese prime minister. Within the corrupt Palestinian Authority, Salam Fayyad worked for one of the banks forming the U.S. Federal Reserve and the World Bank before he became the Palestinian finance minister and then the kangaroo Palestinian Authority prime minister in the West Bank appointed under the semi-dictator Mahmoud Abbas. Moreover, almost all Arab finance ministers are affiliated to the major global banking institutions. All of them also strictly adhere to the Washington Consensus of the International Monetary Fund (I.M.F.) and the World Bank. Are the Tides Turning in the Arab World Or is America Hedging its Bets? America, Israel, Britain, France, and their allies look to be facing major losses in the Middle East and the Arab World. It has already started in Lebanon where the corrupt March 14 Alliance has been in decline. Since 2008, when Walid Jumblatt and his Democratic Gathering left, the March 14 Alliance no longer formed the parliamentary majority in Lebanon that it so heavily touted. The election of a new prime minister has highlighted this reality. Hezbollah, the Amal Movement, the Free Patriotic Movement, the Marada Movement, and their political allies in Lebanon through parliamentary manoeuvring have removed Saad Al-Hariri, the son of Rafik Hariri, from the Lebanese premiership. As long as the current structure of the Egyptian regime remains unchanged in the wake of Mubarak’s departure, neo-colonial interests will continue to be served. 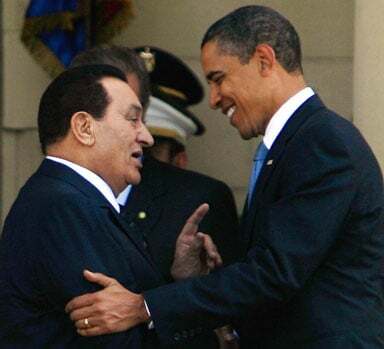 As long as their interests are secured, they would have sacrifice Mubarak. The face of a regime does not matter; it is the interests that it serves. Whether correct or incorrect, the Mubarak regime has claimed that the U.S. and Israel have been behind the mass protests throughout Egypt. Iran, Hezbollah, Qatar, and Hamas have also been accused of helping orchestrate the protests alongside the U.S. and Israel by Cairo. These accusations by Mubarak’s regime are meant to demonize and delegitimize the protest movement as foreign ploys and to divide the Egyptian protesters. The U.S. government seeks to maintain the same kleptocratic status quo in place in Egypt and Tunisia, either under continued dictatorship or under an outwardly appearing democratic political system. In other words, the aim is to keep the same substance, but to change the form. Kleptocracy can work under dictatorship or “managed” democracy. As the protests across the Arab World gain momentum, the U.S. and its allies are working to “try” to mix their own “opposition” figures amongst the protest movements and to bring their “agents” into power. In other words, the U.S. is politically hedging its bets. 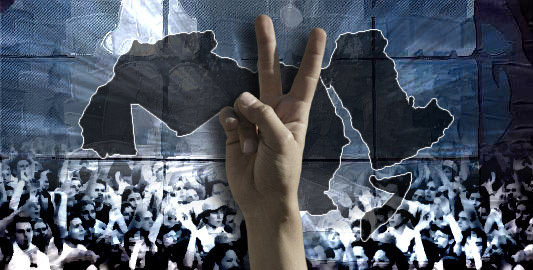 If the Arab protest movements are not attentive to this process of infiltration, the emerging wave of so-called democratization in the Arab World could end up being a manipulated process which retains the control of foreign powers. America and the European Union are not the models for democracy or liberty. The Arab people should not sell themselves short by restraining themselves to such narrow definitions of democracy. Nor do they need culturally-biased or latently racist and ethnocentric lectures about democracy. They are a very capable plurality of people. The Barcelona Declaration of 1995 has called for massive economic restructuring, market liberalization, and the creation of a free-trade zone between the European Union and the Arab World. The U.S. Middle East Free Trade Area (MEFTA) also is a economic project that parallel’s the steps that the E.U. is taking. In this regard there has been a U.S. and E.U. sponsored roadmap for eventually integrating the European Union, Israel, Turkey, and the Arab World. This geo-political and socio-economic project is known under the framework of the “Mediterranean Union” or the “Union of the Mediterranean.” The process envisions “gradual” reform through a so-called democratization process within the Arab World. Something old has to be restructured or taken apart to make something new. The “New Middle East” project is intended to do this. The aim is to weaken and change the old states of the Middle East and North Africa to make way for integration. Democratization is needed to advance this project in order to allow stable integration whereas chaos is used to prime these states for eventual integration. In this regard, Turkey is now the model state. Since the establishment of the Turkish Republic, Ankara has been run by authoritarian governments and the Turkish military. Turkey, however, has been transformed into what outwardly appears to be a relatively liberal democracy. Despite this outward change or transformation, Turkey is still a kleptocracy that serves the interests of organized capital. Ankara is also at the forefront of establishing a regional market and bloc in the Middle East through a broad set of agreements jointly signed between Turkey, Jordan, Lebanon, and Syria. Ankara is also deepening its ties with Iran, which Zbigniew Brzezinski has explained that the U.S. government should support. According to Brzezinski, deepening Turkish-Iranian relations would benefit America in the long-term. Thus, Ankara is working to integrate itself economically with Iran and Syria, as well as other Middle Eastern states. The Turkish government has deliberately made public shows of opposition to Israel to boost its credentials amongst Middle Eastern populations as a possible leader. In this context, Turkey has been moving closer to the entire Arab World and Iran. In 2010, it launched a state-run Arabic channel. Turkey has also become so close to Tehran and Damascus that it Ankara is being called an ally or strategic partner and a member of the “Resistance Bloc” by Syrian and Iranian officials. These all seem to be steps intended towards creating a regional bloc in the Middle East and North Africa. What is missing in the process of economic integration between the E.U. and the Arab World is “institutional democracy.” Many important institutions will be undemocratic in nature. The financial and banking sector will operate outside the realm of public control and accountability. Under such conditions, the banking sector will eventually control the state’s political structure. While on the surface a set of democratic-looking states may emerge, they will be controlled by undemocratic forces. It is paramount to understand that the Arab dictators and tyrants serve the interests of organized capital. This is their primary function. They are elements of the global system formed by organized capital. Looking back, protests and riots started in 1977 against the regime of Mohammed Anwar Al-Sadat, Mubarak’s predecessor. The causes of these protests were the neo-liberal policies that the I.M.F. had handed down to Sadat. The I.M.F. policies ended government subsidies on basic daily commodities of life. Food prices jumped and Egyptians became hard-hit. Sadat ended the protests through the use of force by the Egyptian military and making promises to bring back the state subsidies. The protests of 1977 ended as failures. 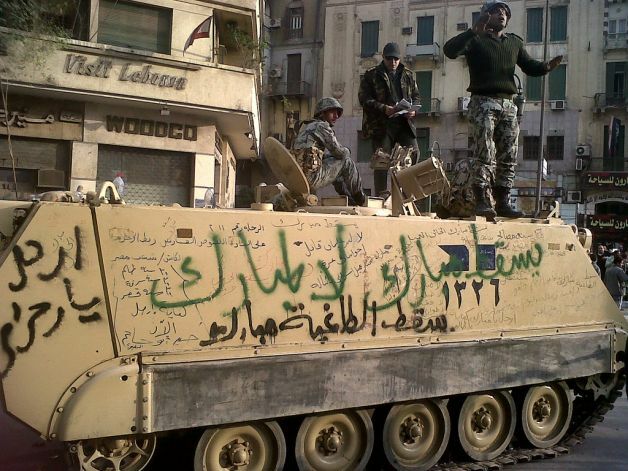 Today the situation in Egypt is far dire and the U.S., the E.U., are looking for other options than just military force. The U.S. and the E.U. on one hand have given low-key vocal support for the changes that the Arab peoples want, but on the other hand work to maintain the oppressive regimes in power. The U.S. and E.U. support these regimes overtly and covertly, because they serve organized capital. It should also be noted that it is the capitalist class in the U.S. and the E.U. that are against liberty in the Arab World. When the U.S. and E.U. are mentioned it is in context of this capitalist ruling class. The government and state in America and the nations of the European Union merely serve as agents of this capitalist class. In Tunisia, the protests have calmed down. The structures of the old regime still exist. Many of the same ministers and officials are still in power. In a clear show of American involvement, the U.S. Assistant Secretary of State for Near Eastern Affairs, Jeffery D. Feltman, went to Tunis to hold consultations with officials on the formation of a new Tunisian government. Feltman is especially known for his tenure as U.S. ambassador in Beirut where he worked against the interests of Lebanon. More importantly, the interests of organized foreign capital that propped up the dictatorship of Ben Ali in Tunisia are still in place. The Tunisian protests have electrified people worldwide, but they have not turned into a revolution with socio-economic change. Hereto, Tunis has only seen a slight cosmetic face-lift, but all the same mechanisms and the same establishment structures remain in place underneath the face-lift. Global capital still has a strong hold over Tunisia. Such agreements as those between Tunis and the International Monetary Fund (I.M.F. ), the Euro-Mediterranean Partnership with the E.U. to form a Mediterranean Union, and various economic agreements with the U.S. and the European Union still place a yoke over Tunis. Tunisians must reject the economic agreements and neo-liberal policies that have degraded their society. Learning from 1848: Will the Aftermath of 1848 Repeat in 2011? Yet, this global political awakening is not new. 1848 saw the same events unfold in Europe under the use of the printing press and new means of communication. 2011 has seen it occur via the internet and social media. In the context of a zero-sum game or conflict, political awakenings by mainstream societies are a historic process tied to the ruling classes movements towards greater control. The members of mainstream society become more aware of their conditions, the closer they get towards a point of zero-gains. This is while the closer to absolute the control of the ruling classes becomes over mainstream societies. It has to be asked again: what lessons can be learned from 1848? The conditions in 1848 Europe were the same as in the Arab World. Poverty, unemployment, exploitation, and lack of freedom were rampant. Mainstream society was in a state of social anomie. The same fate as that of the Paris Commune should not reoccur in Egypt or any part of the Arab World. The revolutions should be real and bring about radical socio-economic change. The U.S. and the E.U. are not advocates of democracy and liberty. They support kleptocracy. The kleptocracy can take on different forms. It could be democratic or authoritarian in nature. Its main prerequisite is that it must serve the global capitalist class and not merely the local capitalist elites, as in Russia or Iran, where the national elites are challenging Western European and American capitalism. Are these popular protests the birth pangs of a new Middle East? Are the Arab people regaining their political agency? It is time for the long-awaited re-entry of the Arabs into the pages of history. The Arab people must be on their high guards to continue their revolution without it being manipulated by organized capital. So-called stabilization funds from the E.U. and other assistance is not meant to help, but to manage the course of Arab societies. Mainstream Arab societies must recognize this process of financial manipulation and cut the economic strings that shore up the Arab regimes. The U.S. and E.U. imposed economic agreements, which amount to exploitation and theft, must be nullified. Political power should not be subordinated to economic power. In this context, institutional democracy should also be kept in mind. Otherwise, the same aftermath as 1848 will repeat itself as the aftermath of the 2011 Arab Spring. The other “alternative” which might emerge as a result of the protest movement is that Arab governments will outwardly look like democracies. Instead, they will work to maintain the kleptocractic status quo for a social minority. The status quo will prevail. Economic exploitation will continue under the guise of democracy and democratic governance instead of open dictatorship. Democracy is not a matter of holding elections, where voting at the ballot box becomes a ritual. Democracy must centre on freedom of the mind and livelihood through economic democracy. In order for this to emerge, people throughout the Arab World must address the impacts of global capitalism on the very structures of the domestic political system, namely how successive authoritarian regimes have served foreign interests. Mahdi Darius Nazemroaya is a Research Associate of the Centre for Research on Association (CRG). In the context of Arab societies, it is debatable if the Ottoman Empire was a colonial power. If the Ottoman Empire is to be considered a colonial power, it was a different form of colonialism than that of Western Europe. There is a far stronger case for colonialism in regards to Eastern European societies within the Ottoman Empire. Also, the Ottoman Empire was a political state, like the U.S., and not an ethnic-based stated. Moreover, the role of ethnic nationalism only became strong towards the last days of the Ottoman Empire. When the March 14 Alliance did form a parliamentary majority, it was barely a majority. It always exaggerated this standing to make itself sound like it had popular support amongst the Lebanese. The March 14 Alliance was not a popular majority ever, but a majority formed from consensus sectarian-based politics. In other words, the March 14 Alliance did not represent the demographic majority of the Lebanese population. Ross Douthat, “Obama the Realits,” The New York Times, February 7, 2011, p.A23. “Senior US envoy presses for democracy in Tunisia,” Agence France-Presse (AFP), January 24, 2011. Zbigniew Brzezinski, Out of Control: Global Turmoil on the Eve of the Twenty-First Century (New York City: Charles Scribner’s Sons Macmillian Publishing Company, 1993), pp.47-55. Zbigniew Brzezinski, “The global political awakening,” The New York Times, December 16, 2008. Abigail Hauslonner, “Will ElBaradei Run for President of Egypt?” Time Magazine, February 20, 2010.